A music therapy project for young adults with learning difficulties in Galloway has led to the release of a Christmas DVD. Earlier this year, a former store room was converted into a small studio at the Activity and Resource Centre in Newton Stewart. Since then clients - many with conditions such as autism and Asperger's syndrome - have been making music under the guidance of former professional guitarist Paul Brown. He spent 30 years as a touring musician, playing in West End shows and even a residency at the Monte Carlo Casino. Now he has left the high life behind and settled in Galloway, Paul is helping disadvantaged people who never had a fair throw-of-the-dice. He recognises how music can help them. He said: "Music is fantastic, because if you feel angry it's better to take it out on a drum kit; if you feel angry you can write a beautiful song; or if you're feeling very sad you can take the sadness out of yourself by putting it into a piece of music. "In that way, you're getting unwanted emotions out of yourself." 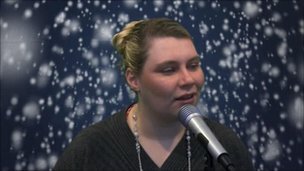 The festive song Christmas and Friendship was written by Alexander Murray, 19, and is sung by 27-year-old Amanda Knight (pictured). Alexander says he has wanted to write songs for years "but it never worked out". He says he "cherishes" the day he met Paul because now, with his help, the music is flowing. As well as composing Christmas and Friendship, Alexander has written seven or eight other tracks and hopes to bring out an album in 2011. It has been a therapeutic process. He said: "I have had some difficult times recently. "Paul came up with the idea of me writing a song about me being sad and how it's going to get better. "That number was really, really uplifting." The project has also been a great boost for Amanda who sings lead vocals on the Christmas DVD. She has proved to be a natural performer with a lovely voice. "I have always wanted to be a singer and now I have fulfilled my dream," she said. Amanda is a great admirer of Susan Boyle who has achieved international stardom despite also suffering from some learning difficulties. "She has got a powerful voice and I think to myself (that) one of these days l could be the same as her," she said. Amanda says friends are encouraging her to enter the next X-Factor auditions and she says she just might. It is a measure of the confidence the ARC music project has given those involved. Manager Beth Bleasdale says they have improved their self-esteem, their communications skills and their ability to work together. She says the DVD - which also features primary five girls from Penninghame Primary School in various Christmas scenes - is a "a great big achievement for everybody who has been involved". The DVD is also endorsed by the Eastenders actor Shane Ritchie who plays the character Alfie Moon. Shane has recorded a personal message of support from himself and the cast of the show. In it he says: "I'm so sorry I can't be with you all up there in south west Scotland as I'm currently pulling pints in the Queen Vic here in Walford. "But I'm so happy to hear about the work you're all doing in Dumfries and Galloway's Cree Studio." The studio - made possible with the help of funding from the Postcode Lottery and Turning Point Scotland - is also getting external commissions, including some work on behalf of Dumfries and Galloway Council.